This is one kind of shrub or small tree with brown flaky bark, can grow about 6m high. All the leaves are really ugly, bitted by insects. These small fruit, about 15 mm. diameter, are probably poisonous. Typically these fruit are green becoming white and this color when ripe. According some resources I found while searching, The plant bears separate male and female flowers on the same tree; flowers tiny, without petals, in dense clusters in leaf axils, male flowers with 4 to 5 times longer stalks than females. The tree Glochidion litorrale is a pioneering species in damp gullies and rainforest. It belongs to the Rubber Tree Family (Euphorbiaceae) but does not have white sap. It has a wide distribution, ranging from India, Sri Lanka, Indochina, S. E. Asia. I don’t know where other places have this plant in Singapore. It is very rare in Singapore, does it mean it can’t grow well here? 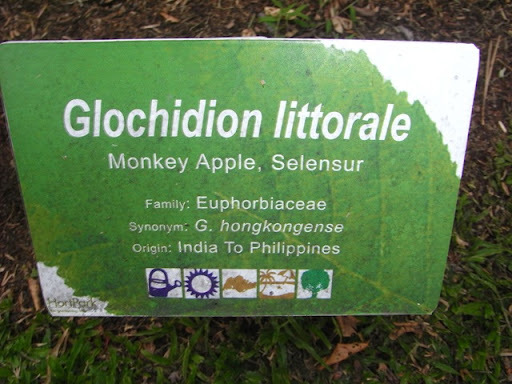 According to the sign I found below the tree, it is called “ Monkey apple” no further details been given. Are these fruits editable? Are these lovely pinky fruits monkey’s favorite food? 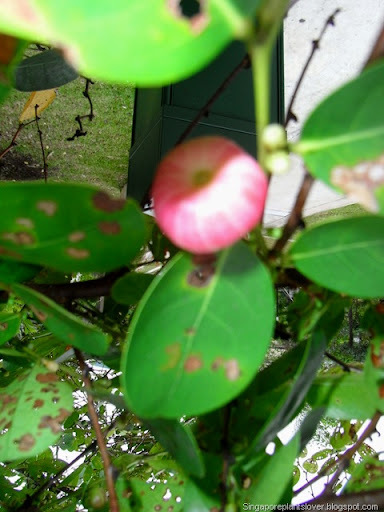 Ann have a post crab apple, I am still trying to find out if there are the same family. Visit Beverly at Pink Saturday and all the participants who share their sweet pink mood for this weekend. Cheers. I have never seen this fruit before. 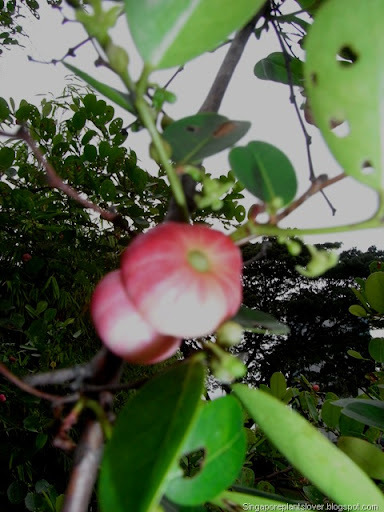 I looks a bit like the water apple (jambu air). Must be so rare, I have never seen it before. 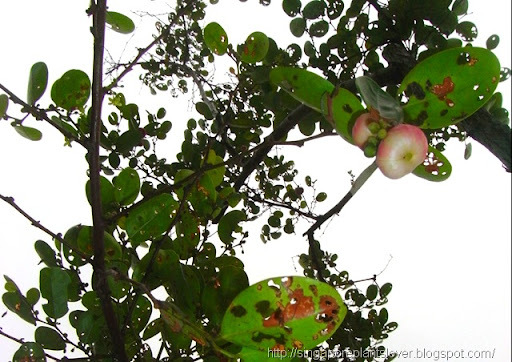 common name Ubah, Jambu kera, Selunsor, Hujan panas, Daun san sik. What a fascinating tree! Thanks for sharing it with us. Happy Pink Saturday! Very interesting thank you for sharing...Happy Pinks! Hello what a lovely pink Saturday post. I love your blog I am a follower. Have a great rest of your weekend. 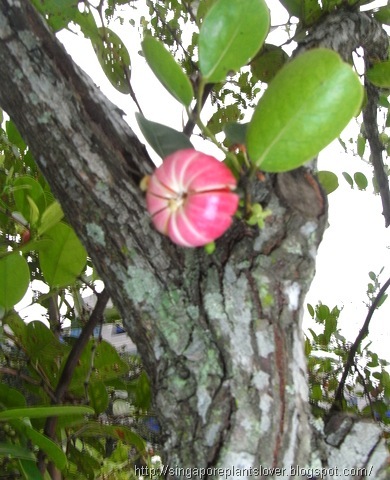 I have heard of a "monkey apple" but never have seen one. We have an apple tree but it is so hot here that our leaves look like yours too. What a fascinating plant. I've never seen anything like this before. This was a very interesting post. I hope you are having a wonderful day. Very interesting. I love hearing from other parts of the world. 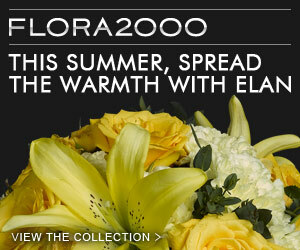 I've never seen blooms like that! How interesting!